Yes, you heard that right – organizing before Christmastime! It’s probably not a word you hear very often around the holidays, but it’s one I feel should be considered. Now is the perfect opportunity to take stock of the things you own, the things you need, and of course, the things you’d like to own before the frenzy of gift giving begins. It’s also the perfect time to do this for everyone else in your home as well, because it’s really easy to shove what no longer fits, works, or brings joy to the back of the closet or cupboard. I know there is so much to do to prepare for the big day, but taking the time to take stock before you come home with carloads of things and unwrap present upon present in your living room, can really help when it comes to maintaining a minimal lifestyle. Below is a little guide to taking stock and organizing parts of your home, with small but simple ways to celebrate the blessing in being able to both give and receive during the holidays. In recognizing that we already have so much, and by being mindful of what we already own, we can pair down our wish lists and be more intentional this time of year. With that being said, I am nearly done with several holiday gift guides full with ideas that will ignite young ones imaginations, creativity, and appreciation of family and home. I am not anti-giving gifts, I actually love this time of year and really enjoy making and buying things for others who I love and appreciate, but I do things it’s important to recognize the message that simply buying more and accumulating excess for the sake of buying and having can deliver. 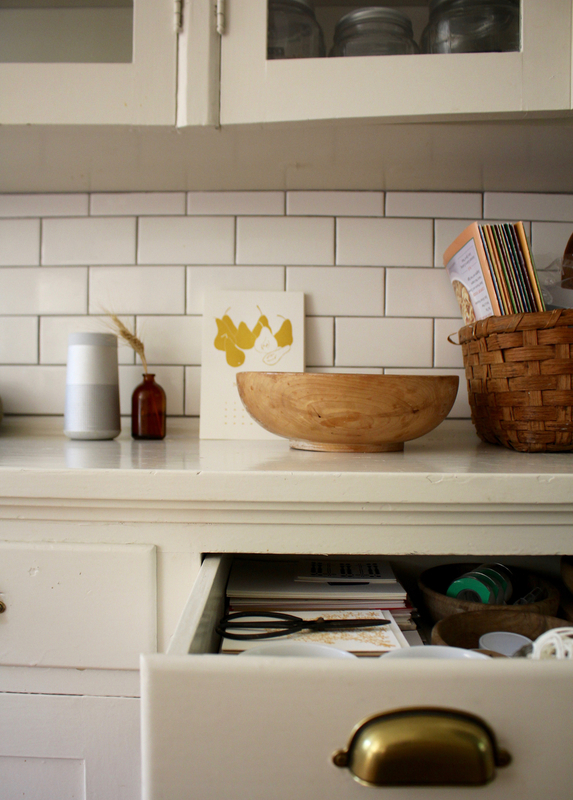 Taking stock can help us be more mindful this season, and organizing our home is a great way to start the new year. Step One | Listen: Put on some holiday music – something that gets you in a good frame of mine to edit and sort. Step Two | Sip: Pour yourself something warm or refreshing to drink. It’s always nice to start with a little treat. Step Three | Empty: Take all contents out of said drawer, closet, cupboard, basket, or bin, and place them on a large surface area, like a tabletop or kitchen island. Being able to see everything at once gives you an overhead look at your drawer’s contents and helps create a clearer picture of what you have and how you want to organize. Step Four | Clean: Wipe the interior of said area down so you have a fresh canvas to work with. Use natural methods so you will not be spreading chemicals to your items. Step Five | Sort: Comb through the drawers contents for two things: trash and recyclables – then place those where they need to be. Trash means things that are broken or can no longer be of use to anyone. Recyclables are items that are either made of recyclable materials, or can be donated and of use to someone else but it no longer needed in your home. Need Question: What am I out of and could use more of? Need Question: What is broken, no longer fits, or is no longer working well, and should be repaired or replaced? Want Question: What could really help or inspire me to live more fully and love more deeply? Want Question: What have I always wanted, something that will add beauty or goodness to our home? This is the step that will take the most time because this is you being mindful. It’s good and important work to reflect on the things you bring into the spaces you live in, because they occupy energy and can ultimately create an environment that is cultivating excess and unease rather than contentment and comfort. 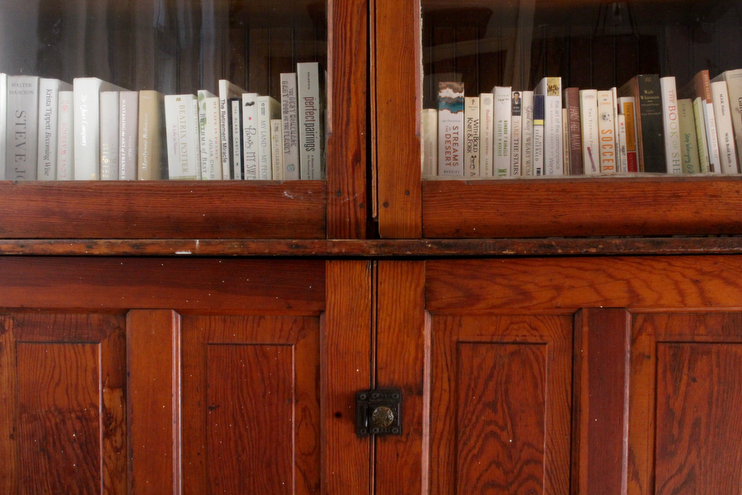 Step Seven | Make Homes: Now is the time to return everything you’ve emptied, sorted, and edited to it’s rightful home. If it does not have a home, per se, you should make one. 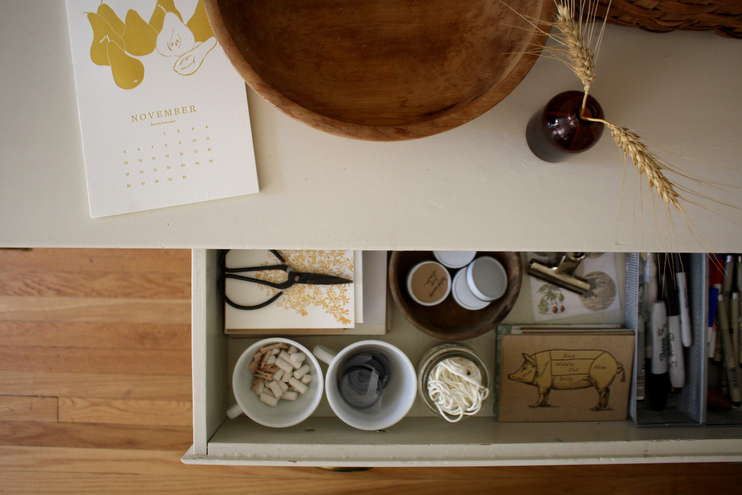 For example, gather old cups, wooden bowls, and other small vessels to store the little items in drawers. Put things that are likely to roll around or get lost in the shuffle of papers in containers, and group accordingly. For art supplies, pens, markers, chalk, and/or other long items, store in a drawer organizer or the end of a cereal or other long cardboard box cut off. I like the cereal box method because it’s recycling materials you already have, but I already had pen organizers from my teaching days on hand, so I used those.You can also use Mason jars for just about everything, as they are the coconut oil of the organizational world and have umpteen possibilities. Use twine, large paperclips, or rubber bands to keep paper things together, like envelops, post cards, important documents, or stationary. Roll, fold, or hang clothing so it’s able to be seen and therefore, used or worn. The hairbrush should live in the bathroom, as should those stray bobby pins. The tools should live in the toolbox, and the coins in the coin jar. Step Eight |Write: Now that you have taken stock and have cleaned and organized said area of your home, now is time to revisit those reflection questions from Step Six, and make your Christmas lists. Our family follows the Want | Need | Wear | Read gifting philosophy, which works well and prevents mad chaos of getting and gifting too much stuff. Less is more, and it really makes a big difference in how our kids interact with their new toys come Christmas morning. We are also going to give each of the kids experiences in handmade coupon books I am going to craft and wrap up for them this month – gifts from mom and dad. I will share more about that later, but for now it’s an idea you can ponder if you are eager to maintain a simpler lifestyle. So that’s that! Not too complicated, eh? I don’t suggest you empty the whole house, or even a whole room in one sitting, but I do suggest noting target areas, such as the kitchen, toy room, closets, dresser drawers, and bookshelves. I’d also love to hear more about how your family approaches this season, if you too, value mindfulness and simplicity with what you buy and bring into your home! Hi Katie, we explained to my in laws that we simply didn’t have space for so many toys. And we explained that unfortunately more toys meant that other toys would have to be given away. This resonated with my mother in law as she did not like the idea of us giving away things she had bought our kids. Maybe it could work for your in laws Too? Yes to all of this! We, too, subscribe to an intentional lifestyle, both in time spent and things gathered. We lived years in a 300 square foot studio and just moved to a 500 square foot space as we await our first baby, which both helps and insists upon this mindset!